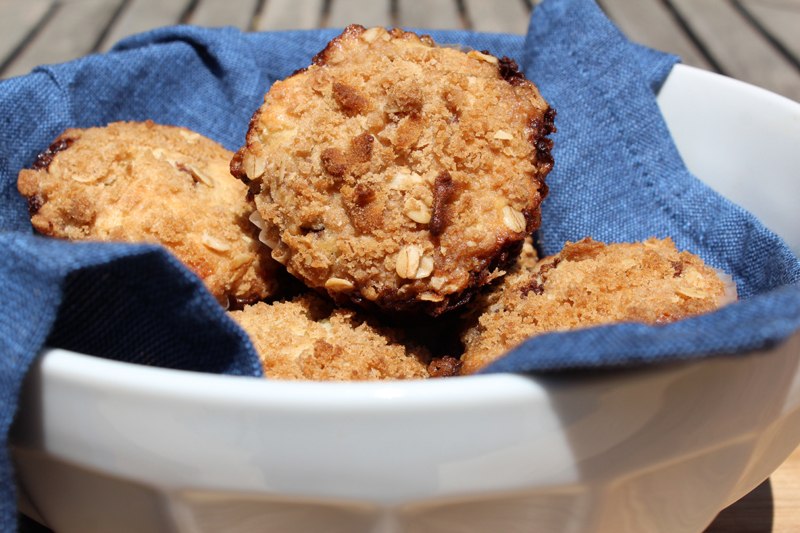 Happiness Project Recipe #14: Husband-Hero Cinnamon Oat Muffins! It’s been an emotional week (to say the least) & whenever my body forces me into round-the-clock bed-rest, I tend to become either very depressed over it or very contemplative. Last night, as I lay exhausted in bed, listening to my beautiful red dog snoring softly from the floor & my husband’s slow, steady breathing beside me, I was nearly overwhelmed by how deeply grateful I am for the people who care for & love me so unconditionally, especially my husband. It’s not an easy thing to live in an environment frequently dominated by (my) pain, moodiness & depression. It takes immense strength & courage to walk with me down this turbulent path of strife & uncertainty. Yet through it all, he does, quietly & softly. Even within this trying time, there has never been a day where I have not believed in the love of my husband. In our 7 years together, he has taught me & continues to teach me that as long as we’re together nothing else matters. In the end, as long as we have each other, everything will be okay. Love will pull us through. So this muffin recipe is dedicated to my husband, who loves all things cinnamon. He is my knight in shining armor. My Imzadi. My hero. My world is a better place with him in it. Always. Preheat your oven to 375F. Butter 12 muffins cups or line 12 cupcake tins. First, mix all your Topping ingredients together with a fork until nice & crumbly. Set aside. Now, mix all your Filling ingredients together with a spoon until the consistency is similar to that of frosting. Set aside until later. For your muffins, in a large bowl (by hand) whisk together the butter, milk & eggs until well combined. In another bowl, stir together your flour, oats, cornstarch, sugar, baking powder, salt, nutmeg and white chocolate chips. Pour the dry ingredients into the wet one & stir until just combined. Now, to get messy! Fill each muffin cup or cupcake tin with 2 tablespoons of batter. Then drop 2 teaspoons of filling on top, in the middle of the batter. With your remaining batter, drop another 2 tablespoons of batter on top of the filling. Lastly, sprinkle your crumbly topping evenly over each muffin. Bake for 18-20 minutes for cupcake tins or 20-24 minutes for muffin cups. As your muffins are baking away, you’ll notice that the cinnamon filling will start to bubble up from around the edges of the batter & that’s okay. It’s supposed to do that. For your Glaze, combine the butter, sugar and milk, stirring with a spoon until the glaze is smooth & shiny. If you think the glaze is too sugary (I personally like a sugary glaze), add another tablespoon of milk to thin it out. Cool your muffins completely before drizzling on the glaze (I have not yet drizzled on my glaze, hence the naked muffin photo above). « Happiness Project Recipe #13: The BEST Chocolate Chip Muffin!